Email is short for electronic mail. This is a kind for mail service that works similar to the postal service. A message is created by you on your computer and sent. This reaches your server and sits there till the server processes the outgoing messages. The server would locate the server for this recipient address and pass on the message directly to the server or the nearest one. Once it reaches the recipients it will wait there till the time the recipients downloads or reads it. IM is short for Instant Messaging. Instant Messaging enables online real time communication between two users logged in simultaneously. Every time a user presses enter the message gets broken up in packets and is immediately transmitted over the net. These packets are received on the other ended, decoded and displayed on the recipients screen. Email is generally independent of the software used to create it. This means that one person may be using outlook to create a mail while the other may use Eudora to download and read it. The users need not be online at the same time. The IM, however, would require the user to be logged into the internet server and use the same application like the msn, gtalk, skype, etc. Secondly the users need to be online at the same time. With people in different time zones this becomes very difficult. Email allows you to send attachments along with the messages. The attachments can be files of any type, however, the size of the files is generally limited by the email service provider. IMs nowadays allow you to transfer unlimited data between the users and some IMs also allow you engage in audio chats making the users talk just as they would over the telephone. This service generally uses Voice Over Internet Protocol (VOIP). 1.Email is short for Electronic Mail and the mail is transmitted from the sender’s computer to server and from there to the recipients server from where it can either be viewed or downloaded. IM is short for Instant Messaging and needs the users to be logged in to the same server. Messages are delivered instantly. 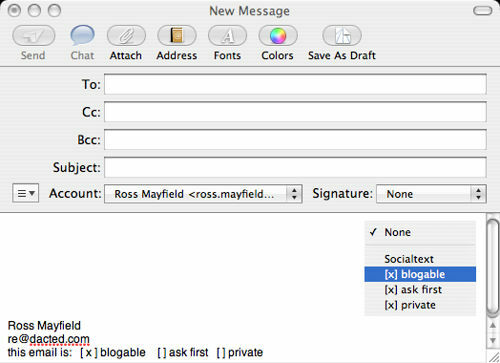 2.Email may be read independent of the software that was used to create it whereas the IM requires the users to use the same client. 3.Emails may only be read as and when the recipient downloads and views it whereas in IM the messages are displayed on the recipient’s computer instantly. N Amit. "Difference Between Email And IM." DifferenceBetween.net. November 8, 2018 < http://www.differencebetween.net/technology/difference-between-email-and-im/ >. The apostrophe, in ‘from the sender’s computer,’ is correct. What happened to the apostrophe that was needed in ‘to the recipients server’? That is, should be: ‘to the recipient’s server. With an android phone one can download an app as if its a computer with windows 10.